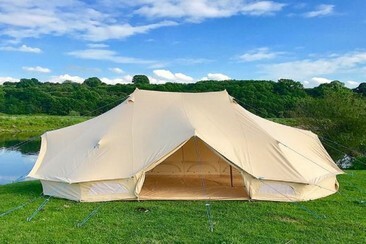 The Glamping Company offers you already pitched tents, for two people in the Glamping Area inside the festival, where you can accommodate and enjoy in complete comfort your favourite event. No need to carry and pitch the tent, and no fights for a piece of ground in acceptable conditions. We have everything ready for you, you only need to have fun when you arrive! Festival Tickets are not included in your accommodation price, and must be booked separately. 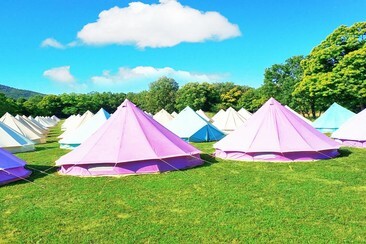 The Glamping Company offers you pre-pitched tents for one or two people in the Glamping Area inside the festival, where you can enjoy the festival in comfort. No need to carry and pitch the tent, and no fights for a piece of ground in acceptable conditions. We have everything ready for you, you only need to have fun when you arrive! There is a breakfast buffet served from 9 to 12h with fruit, juices, coffee, pastries and bread. You'll also be greeted with a courtesy/welcome drink! Adaption of the Bell Tent's comfort for a less expensive and more personal format. 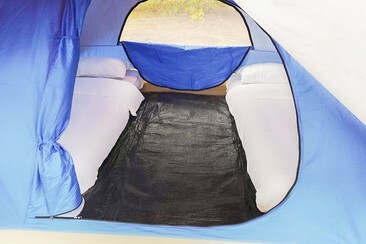 Easy Tent provided with fully equipped inflatable bed, for one or two people, couples or friends, allowing you to sleep with total comfort and privacy. Festival Tickets are not included in your accommodation price, and must be booked separately. - Double cabin, installed inside a container with central power & air conditioning systems. - Terrace, one of the sides of the container is folding to the floor to became a terrace with tables and banks and sunshades for summer use, for winter use it applies closed common area with fireplace. - Isolated container to keep a good habitability inside the capsule. The container must be plugged to a power supply. - LED intelligent sliding central control, Temperature display, calendar function, Reading lamp, Backlight headlight, Ceiling light - LED backlight display, Sci-tech ceiling, Hollowed out dreamlike ceiling (double ceiling). - Toughened glass leaning plate, Electronic safety box, Powder fire extinguisher, Ultra sensitive smoke alarm, Deluxe waterproof dressing mirror. - Ajustable air conditioning cycle system, New air ventilation (M3/h): 30, Advanced bedplate (flame retardancy, bug prevention, anti mildew), Ergonomic skidproof staircase. If you want to go to a festival but don't feel like carrying and pitching a tent, the Glamping Co. is the perfect tent for you! Like a Bell Tent but for groups of more than 4 people. 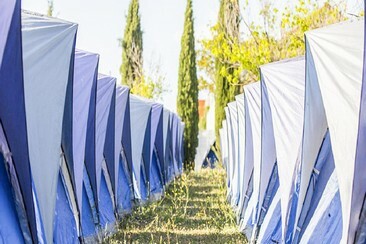 Emperor Tents can sleep up to 8 people. There is a breakfast buffet served from 9 to 12h with fruit, juices, coffee, pastries and bread. You'll also be greeted with a 2 welcome bottles of drink! Festival Tickets are not included in your accommodation price and must be booked separately. The Hotel City House Los Tilos is a complete hotel in Santiago de Compostela for events and active tourism holidays in the capital of Galicia. 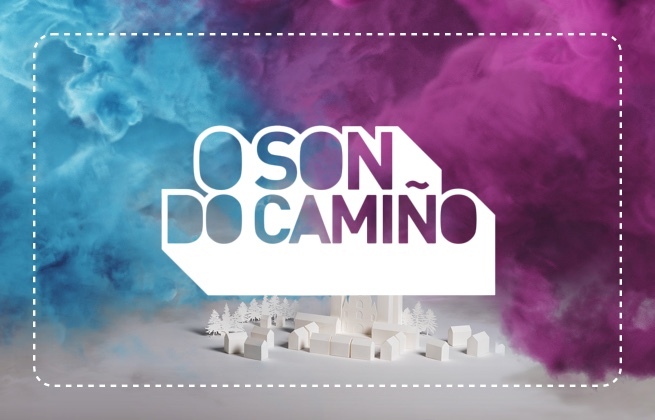 There is easy access by car into Santiago de Compostela from the hotel. The hotel is in a residential area, and El Corte Inglés Shopping Centre is a short drive away. Public buses stop outside the hotel. 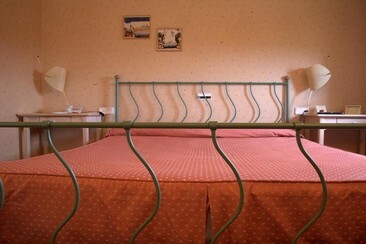 The 92 rooms of the hotel offer you comfort, services and calmness in equal measure. They are accommodations of simple and functional design with classic style and cutting-edge services. All rooms have a flat-screen TV and minibar. There are full air conditioning and an en suite bathroom with hairdryer. 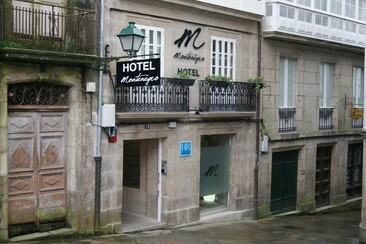 Hotel Montenegro is located in Santiago de Compostela’s charming old town, 100 meters from the Cathedral of Santiago. Monte da Almáciga Park is a 5-minute walk away, and there are many restaurants in the surrounding area. The hotel offers a lounge with a TV, a lobby bar and a coffee service. Guests can enjoy a continental breakfast in Montenegro’s café. Hotel Montenegro offers luxurious rooms set in a 16th-century townhouse. Each room has original features such as exposed stone walls and beamed ceilings, combined with modern white furnishings. Amenities include free Wi-fi access, flat-screen TV and desk. Some have views over the city. Jacobea is located in a recently built building that maintains a careful balance with the architecture of the Camino de Santiago. Situated 10 km from Santiago de Compostela, this hotel is situated along the famous pilgrimage route - very close to the airport. 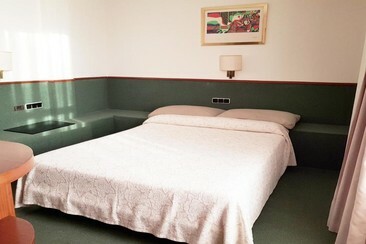 A 4-minute walk from the village centre, this informal roadside hotel is 2 km from Aeropuerto de Santiago de Compostela and 12 km from Santiago de Compostela Cathedral. The hotel is equipped with all the necessary quality services to meet the demands of those who approach the capital of Galicia, whether for reasons of pleasure, rest or work. You can find that rooms in Jacobea are spacious and modern with a comfortable and contemporary style, and served with the warm and friendly touch of its staff. Room amenities also feature free Wi-Fi access, TVs and the private bathroom with shower, bath and free toiletries.